Just as the next round of the UN-brokered intra-Syria talks kick on in Geneva on February 23, US President Donald Trump and Israeli Prime Minister Benjamin Netanyahu will be meeting at the White House for their second face-to-face encounter since Trump’s inauguration on January 20. The Syrian crisis and the disputed Golan Heights both Israel and Syria claim as their own are expected to loom high on the agenda of the Washington meeting. In an interview with Sputnik Arabic, the General Secretary of the opposition of Syrian Forces Union, Fajr Zeidan, said that Benjamin Netanyahu hopes to secure the US leader’s support for Israel’s claim to the strategic Golan Heights, a Syrian territory Israel has occupied since 1967. If Trump throws his weight behind Israel’s claim, this would effectively kill the peace process in Syria. Russia fully supports international efforts to implement provisions of US Resolution 2254, which calls for a ceasefire and political settlement in Syria. 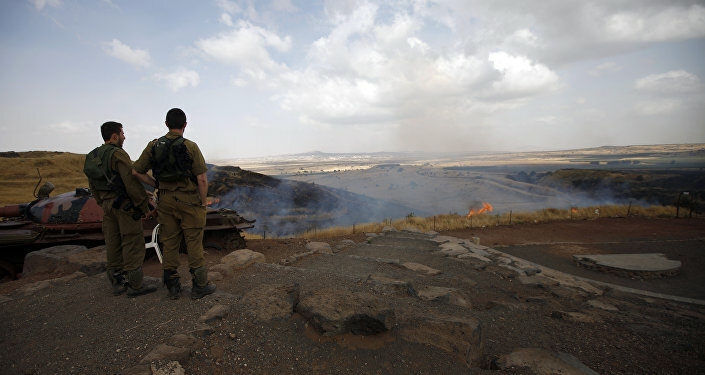 The United States recently joined the search for an early end to the crisis, but if it recognizes Israel’s claim to the Golan Heights, this process would inevitably grind to a halt. The Golan Heights, internationally recognized as Syrian territory, was seized by Israel during the Six-Day War in 1967. In 1981, the Israeli parliament voted to annex two-thirds of the region. Syria insists that Israel should fully withdraw to the pre-1967 border, however, Israel is unwilling to accept such terms as it would give Syria access to the Sea of Galilee, which is Israel's main source of fresh water.